Irritable bowel syndrome (IBS) is, at best, an uncomfortable condition. This week, Su and Jonathan discuss opting to try changes in diet and exercise before moving on the the medicines advertised on TV. Su Robotti: Hi, my name is Su Robotti, and I’m the founder of MedShadow. Jonathan Block: Hi, I’m Jonathan Block, and I’m the content editor of MedShadow. SR: Today, we’re going to talk to you about IBS, the topic nobody likes to talk about, but people that have it, even less. IBS is irritable bowel syndrome, and you’ve probably seen lots of TV commercials. There are lots and lots of medicines out there that can help you with it, and a lot of those medicines will give you other side effects that you can get more medicines for. So at MedShadow, even though we believe that medicines have a very important role to play in improving our lives, we like to talk about skipping medicines, when possible. This is one of those times when it’s a good idea to start off, not with medicines, which will change your lifestyle just a little bit. For example, there are lots of foods that can actually cause irritable bowel syndrome, Jonathan, do you know some of them? JB: Well, sorry to hear about that. SR: However, irritable bowel syndrome can be caused by non-traditional products, it just depends on what your body responds to. So if you find that you are getting symptoms of irritable bowel syndrome, after eating hot, spicy tacos at 11:30 at night, maybe that’s something to avoid, or it could be something much more innocuous like pizza, or peanut butter and jelly. Bodies are very different, and if something is upsetting your stomach and you can figure out what that thing is, believe it: Your body doesn’t lie to you. Also, it can cause gas and bloating, you can talk about it, and there are some foods that traditionally cause gas and bloating. JB: For example, that would be things such as beans — even though they have a lot of health value they also create a lot of gas — cabbage and broccoli. Another thing that might also cause some of the bloating associated with IBS are carbonated beverages, so you might want to skip having so much soda which will probably help your teeth out as well. Another change that you can make to improve your IBS symptoms is to increase your fiber intake. This means that you should be eating some more whole grains, some certain fruits, some vegetables — not the ones that I mentioned, because those can actually exacerbate the situation. And although you want to increase your fiber content, you don’t want to go overboard with fiber because then it could actually end up worsening your symptoms. Another thing that we want to discuss are probiotics. You’ve probably been hearing a lot about probiotics, you can often find probiotics in foods such as yogurt, as well as in supplements. You should know that although there is some research that shows that probiotics are beneficial, the consensus is kind of mixed in terms of just how effective it is. There’s some research that certain probiotics are better than others, so the bottom line is that probiotics may work in some people, and not in other people, but it’s something that you may want to look at. If I could just bring up one other thing that can also help with IBS, without using medications — it’s actually exercise. The reason is that exercise helps to relieve stress and stress is something that can lead to irritable bowel syndrome, but it also stimulates normal contractions in the intestines, and since IBS begins in the intestines, anything that can restore a sense of normalcy or regularity in the intestines is a benefit. There is also some indication that even exercise such as yoga can help to treat IBS. SR: Well, it’s a very physical response, and when you treat your body appropriately and give it exercise and stretch out and do what it’s supposed to do, maybe you can continue and do everything it’s supposed to do. SR: I never heard of an herb called STW–. but there has been some medical research that supports that as a treatment for IBS–. SR: It does. In my family, we get fennel, which is an herb. It’s delicious. You cut it, you eat it raw, and it will solve all of life’s problems. It will make your stomach feel so much better, and it has a lot of fiber, so that‘s why we like it. SR: Isn’t it nausea and constipation what you’re taking this drug to stop? JB: Exactly, and it may actually worsen it in some people at least. Amitiza and Linzess — they have a direct impact on bowel movements, so it could actually lead to either diarrhea or constipation. In addition, with Amitiza and Linzess, some people do experience some abdominal pain after taking those medications, so that’s something to look out for. 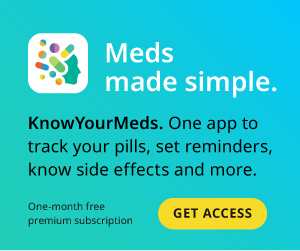 JB: By Tori Rodriguez, and you can find that on our website, medshadow.org, by searching IBS, and you’ll be able to easily find the article and get even more information about other ways of treating IBS that do not include medication. Gee – what is carrageenan?